Nila - This song in Pokkisham would be my latest release. This is perhaps the third time I am working with Mr Sabesh and Mr Murali. When I had gone to record, Vijay had already sung his portions. Mr Cheran happened to be present at the recording session and this was the first time I was working with him for a song. Blue Elephant had worked on translating the dialogues of Autograph into German previously. What happened to ur north India trip??? 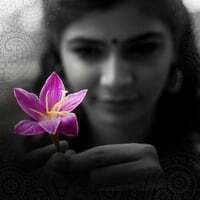 Hi Chinmayi akka,We want you to compire in finals of Airtel Super Singer. I had listened to this song on Kalaignar TV previous Sunday durimg the audio release. Something striked me that it is ur voice. But not really sure also because I couldnt relate that to ur voice. I actually mean i am confused whether it is urs or not because of the fact that the voice sounded completely different..
A good song that u can cherish for ur lifetime. Very nice song Chimayi. I watched that Audio release function. And Visuals of the song also very nice. I really enjoyed this song, when it was played with the audio release function in kalaingar tv.. Note: i don't have any carnatic or any classical base till now. so trainers should be able to start from zero. sorry for this. Looking forward for the song in the net. all the best for you. the last line of ur post"Please do give it a listen [b]if you can" really hurted me..
btw i heard it n was awesome really..
i ve got three q fr u..
1)ujjaini has also joined wit u in dis song??? 2)is ther 11 songs in dis film?? finally a very important question..
3) y u r not seen in super singer nowadays??? I too heard the song in Kalaignar TV during the Audio Launch of the movie. The Lyrics is Awesome with words such as Natrinai, Kurunthogai, etc of Tamil Literature. Icing on the cake is it's pleasantly rendered by u n Vijay Yesudass. Yugabharathi said that it was written first and then the Music Directors gave the tune tune. Kudos to Cheran for such Lovely songs!!! Your song is good and you have done a good job. What i like about this album is no kuthu songs, no double meaning words, clean melody. Real pokkisham indeed ! Loooooooooooonnnnnnggggg time since I have visited your blog. Real apologies for it, but work made me be damn damn busy. About your voice, OMG, I saw Yaavarum Nalam yesterday. Enjoyed Neethu Candra for her voice as it ws your's .. OOOOO maaan, the way you talked, your eNergy..... BRILLIANT !!!! Once dialogue I liked most for your typical talkie style was CABLE TV CUT PANNI THAAN INDA VEETTU LOAN ADAKKANUM NA, PESAAMA VEETTA VITTUDUNGA, CABLE TV POODHUM ...... Was typical ur slang, speed, speaking words continous in a single tone.... OMG !!! Keep rocking Chins, you will have me as ur fan always in ur rolls !!! Will be contributing my views for all ur future posts !!! i know this is off topic. but i am sure you must know the answer. is raginisri in super singer because of politics? BTW your song was very nice. your voice has improved so much since i heard you sing in sapthaswarangal. Once enga chinmayee voice...vow unga songkku than wait pannittu irunthaen... Song is rocking.. esp word anbulla was super..
anbulla manna..anbulla cheuilla.. anbulla padava... super voice..chance illa.. Both vijay & your voice is like a mayilla iragu thadavuruthu mathiri irukku.. totally song was amazing.. keep rocking.. gosh!!!!! so much of fan following e!!! looking forward to the audio release of this film. Realllllly its very nice melody i love this song and I have it as my ring tone in my mobile to hear you through this song allways. Will definitely check it out and get back to you..
Chinmayi, wish you all the very best in your future endevours! The song was superb. I got to listen a few days back. Now I am listening to it quite often; thanks to my phone. Great song and great album as well. Today i happen to hear Pokkisham songs. Ur song is simply suberb. After a quite long time am hearing clear "தமிழ்" words in a tamil song. im 16 years old and i live in jakarta, indonesia. well i love tamil film music, and i heard the song u sang in pokkisham; it's wonderful! ur voice is definitely apt for the song and so is vijay's! i love it! Amazing voice for Aavarampoo song. This song is to you what Chinna chinna Aasai was to Minmini and Netru Illatha Matram was to Sujatha. Hii Chinmayee.. Happened to listen to this song a week b4 n youtube..
Am very much impressed. wat a combination... d lyrics, music n the song rendition by you n Vijay.. everything s gr8. From your part.. I was able to relate to the xpression n ur touch given to each word... Natrinai, Thirukkural.. and also for Badava, thiruda etc.. I really enjoyed this song after Avarampoo.. from Poo song. I started liking the song even after the first time i listened to it. I guessed the song sounds like the voice of the female lead of the movie. After a few attempts, i found both were of urs. english translation of this song pleaseee.